Kathleen Williams chats with Anaconda constituents at a "meet-and-greet" on October 15, 2018. For the last year, she’s been touring the state relentlessly in her bid for Montana’s lone seat in the U.S. of Representatives. With election day now three weeks away, she says early votes are coming in. “State of the race? This is neck and neck," Williams said. She mapped out her top five priorities Monday: healthcare, fostering economic opportunity, conservation and the outdoors, restoring civil dialogue, and national security. Then she turned to the attack ads her opponent, incumbent Republican Congressman Greg Gianforte, has been running. She said they’re based on false information, but they’re having an impact. And she’s peeved. “He’s getting desperate. The ads are fabrications. But if he is successful in scaring people, he may stay in office. And that’s what he’s trying to do, is scare people," said Williams. But Williams said she’s confident that Montanans aren’t straight party-line voters, and are more interested in choosing the right person. 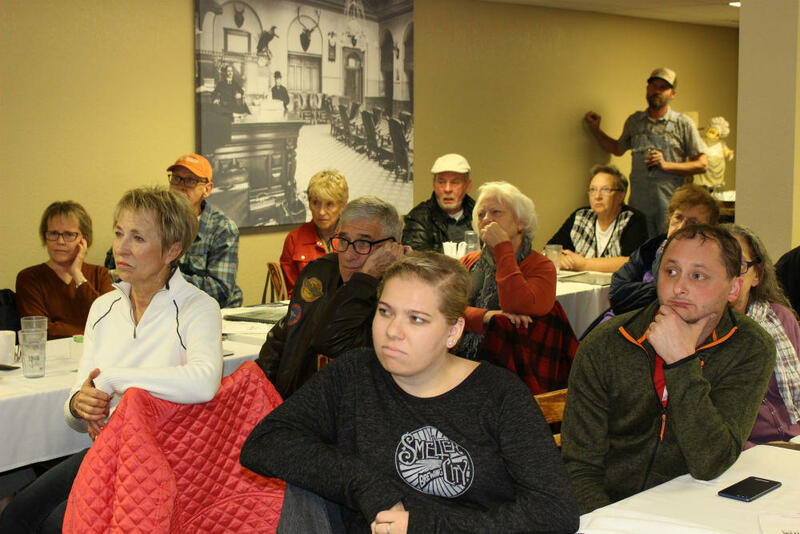 Kathleen Williams' supporters listen as she talks about the "state of the race" at a campaign stop at Donivan's Restaurant in Anaconda. October 15, 2018. During the Q and A portion, she fielded questions on everything from national issues like fake news, to the state’s coal industry, and to more acute local issues, like high rates of suicide in southwestern Montana. “We kinda hit the record for suicide. It’s really bad. One of your goals was fixing healthcare. od you have anything that would address that more than what’s being addressed now, which is very little?" asked one woman at the meet-and-greet. In all of her responses, Williams stressed her experience as a problem solver in the state legislature, and the importance of civility and leading by example. That inclusive message resonated with overall-clad local musician Jarod Yerkes, better known as Smokey, who came out because he wanted to meet her in person. “I’m probably more libertarian, but she is in that line of liberties and rights and people are treated equal and the constitution is the constitution. She’s already got my vote, and she’s got the girlfriend’s vote," said Yerkes. Liana Schmidt is a local volunteer for the Democratic Party who’s been knocking on doors weekly in Anaconda. And she says she sees a lot of support for Williams here, and alignment with her priorities. “I think in the local area, people are concerned about public lands and access to that - because there’s a lot of fishermen and hunters in this area. I think people are very concerned about healthcare, about social security and medicare. I would say those are the issues we hear the most about," said Schmidt. Kathleen Williams says until she crosses the finish line, she’s going to continue to get out and meet people, make personal phone calls, and encourage everyone to vote. Her next campaign stop is in the Bitterroot Valley on Wednesday, and she resumes her camper tour across the state later this week. Election day is Tuesday November 6th. Democrat Kathleen Williams’ campaign raised roughly double the amount of her Republican opponent Greg Gianforte since the start of the July. That’s according to initial campaign finance reports submitted by the campaigns Monday.